7 Ways You Can Use Modular Offices | S. W. Betz Company, Inc.
More facilities are turning to modular offices versus traditional construction. Their installation is quick, inexpensive and clean for minimum downtime, and the panels can be exchanged for doors and windows as needed. They are customized solutions to any space you wish to have enclosed within your facility. Modular offices are pre-built modules that fit together to form the perfect, custom office space for your warehouse, giving you the space you need. Here are 7 ways in-plant modular buildings are used in today’s warehouses and facilities. For operations and machinery that need to be safely enclosed, modular buildings work perfectly. There’s no need for permanent construction to store machinery or products which are regulated and require housing. Quality control is best perfumed in modular structures due to insulated walls, adjustable ceiling heights, customized door and window abilities, and the ability to build them around existing equipment and structures. Why construct a permanent office space when you may wish to move it to better utilize factory or warehouse storage space? Modular offices allow flexibility in location, and the ability to exchange panels or adjust size means they adapt well to facility changes. Printing can be a loud and disruptive process. By housing them in a modular building, expensive printing equipment is protected, and it provides sound, temperature, and humidity control. Loud, expensive, or large machinery can operate securely in modular offices. 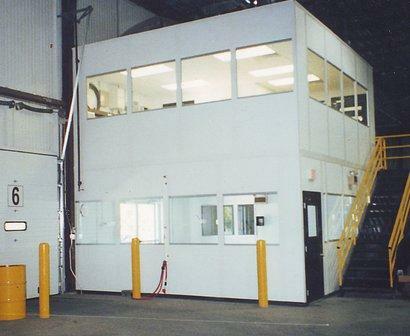 Any sort of printing, medical, pharmaceutical, injection molding, and various other machinery can benefit from the customizable walls a modular building provides. Environmental control is important for inspection rooms. When limited chances of contamination, specific temperatures and humidity, and/or cleanroom conditions are required, modular offices step up to the task. Even if your facility doesn’t have large machinery, printing, or quality control, modular offices are always a great storage solution for anything of value or that needs safe keeping. Chances are, your facility can benefit from an in-plant modular building. To learn more, contact S.W. Betz today! The S.W. Betz Company, Inc. has been providing businesses in Maryland and beyond with all of their essential Weighing, Material Handling, Dock, and Warehouse equipment since 1933. We also assist customers with the installation and modification of modular offices. We carry a variety of top warehouse equipment brands, such as: Morse, Wesco, Magliner, Cogan, Quantum Storage Systems, PortaFab and more. If you would like to learn more about modular offices and inplant modular buildings, please contact S.W. Betz by calling 410-574-1414 or 800-332-0322 today! You can count on the S.W. Betz Company to work with you and provide you with our extensive knowledge of the industry. This entry was posted on Tuesday, March 15th, 2016 at 11:00 am. Both comments and pings are currently closed.